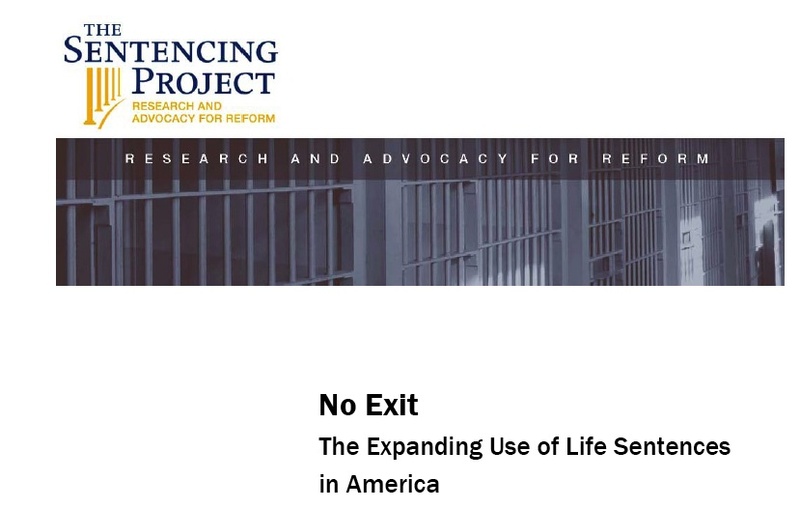 In July 2009 the Sentencing Project (a national non-profit organization engaged in research and advocacy on criminal justice policy issues) released the study, NO EXIT: THE EXPANDING USE OF LIFE SENTENCES IN AMERICA, authored by Ashley Nellis and Ryan S. King. This report measures the increase in the imposition of life sentences as they relate to incapacitation and public safety, fiscal costs, goals of punishment, and the appropriateness of life sentences for juveniles. Sentences of life and life without parole have been used for many years. 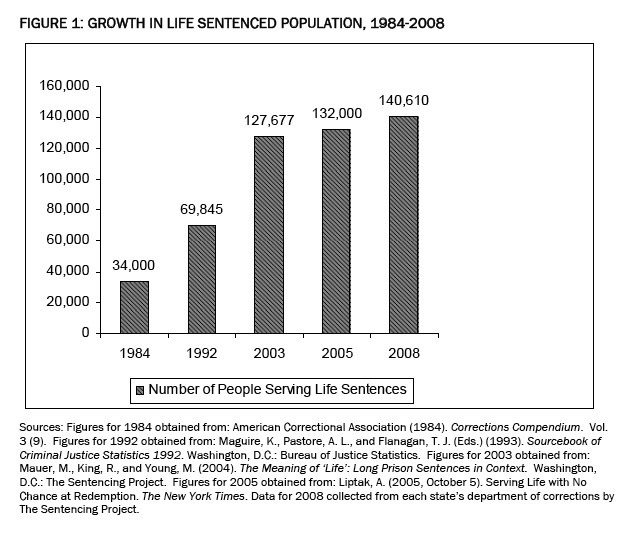 However, over the past twenty years, their use has increased significantly as legislators have expanded the types of crimes that can result in a life sentence or habitual-offender sentences, such as “three-strikes laws”; as prosecutors seek more life sentences for crimes; and as the use of parole has declined. The authors discovered that since their previous report of 2003-2004, more individuals today are serving life sentences – 140,610 out of 2.3 million inmates, representing one in 11 people (or 9.5%) of those in prison. Twenty-nine percent of these (41,095) are serving life sentences without the possibility for parole, a 22% increase between 2003 and 2008. Six states – Illinois, Iowa, Louisiana, Maine, Pennsylvania, and South Dakota – and the federal system, do not offer the possibility of parole to individuals serving a life sentence. Only in Alaska do all life sentences have the possibility of parole. According to the study, parole has become a politicized issue in recent years. Parole boards and governors are increasingly reluctant to grant parole to eligible individuals serving life sentences. “When the choice must be made between granting parole at the risk of political backlash or denying parole, many decision makers will opt for the less risky option.” (p 27) Two Presidential candidates, Michael Dukakis in 1998 and Mike Huckabee in 2008, had to contend with negative criticism concerning individuals in their states who had been granted parole and then reoffended. This study looked at the racial and ethnic make-up of those serving life sentences. It found that racial and ethnic minorities serve a disproportionate share of life sentences. Two-thirds of people with life sentences (66.4%) are nonwhite. Nearly half of individuals serving a life sentence (48.3%) are African-American. The researchers found it more difficult to ascertain the number of Hispanics serving life sentences as many states do not have a separate category for Hispanic. From the states where they could get data, they discovered that 14.4% of persons serving life sentences are Hispanic. When they looked at how many blacks were serving life-without-parole sentences, they discovered that blacks make-up 56.4% of the LWOP population. restore the use of parole. To collect the data used in their study, the authors sent a survey to all state departments of correction and the Federal Bureau of Prisons and received usable data, from all but two states.